Are you a beginner or new to yoga? Are you in good shape with no major injuries? Do you prefer a faster paced class where you are more physically challenged, but still get that amazing de-stressed and relaxed feeling? Below are the classes that will be suit you if you answered yes to these questions. Open to yogis with 3 months minimum yoga practice so you have the basic fundamentals. Postures or asanas are connected through the breath for a transformative and balancing effect, helping you to de-stress, detox and rejuvenate. We will build heat, endurance, flexibility and strength while incorporating standing and seated postures, forward and backbends, hip openers, twists and balancing poses. You will feel energized, de-stressed and fantastic! 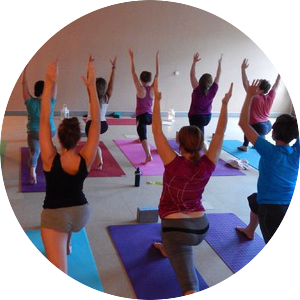 Hatha yoga is a class where you will be challenged with more static poses – working the alignment in detail, building heat and stamina. There might be a bit of flow occasionally, but generally this slower class will give you the ability to go deeper in the postures – working your alignment, stretching and strengthening. These movements will increase circulation, improve posture, relieve tension in the body, and create a sense of well-being. Breathing, relaxation and meditation techniques will be practiced to make this a well rounded yoga class. Great for beginners or anyone that loves a slower paced yoga class.